There are several article types to choose from: HTML, PHP, BBC, External and Cat List. All will share similar options, except for the Cat List and there are some different options available in the text editor for the other types of articles. 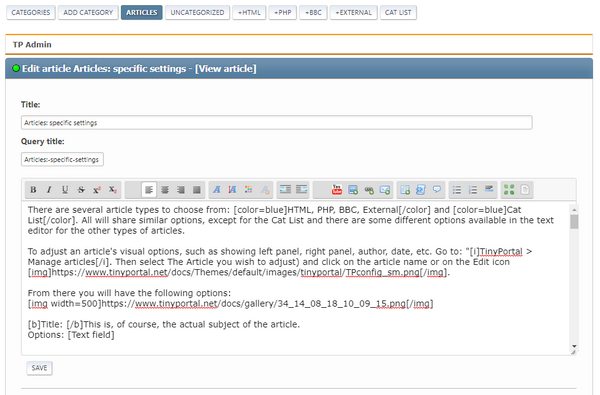 To adjust an article's visual options, such as showing left panel, right panel, author, date, etc. Go to: "TinyPortal > Manage articles. Then select The Article you wish to adjust) and click on the article name or on the Edit icon . Title: This is, of course, the actual subject of the article. Query title: This is a feature where you can create 'meaningful URLs': specify a short text to be used in the page URL display. Body Text: This is where you write your content. - Show On Frontpage: will make the article appear on the frontpage of TP. If you set the option of "use intro" the introtext content will be used instead. - Set as sticky / non-sticky article: will make the article appear on top of the article list in the category. - Lock this article for editing: will lock the article. Approved: Indicates of the article has been approved. If not approved it will show in the 'submissions' list. Author: Defines ownership of the article, may be changed to reassign to another user. Publish: This allows for an article only to be published for a given period of time. Category: ..the spot to put your articles. Use Intro: Here you can specify if an Intro text is to be can be displayed with a Read more... link on the category page. When you set this option to yes, you should also maintain an Intro text (see below). Intro Text: Here you can specify a brief introduction to the article that can be displayed with a Read more... link. It is connected to the setting "Use Intro": if this is set to No, the intro text will not be displayed. Type of article: This an easy way to change the article type.
! careful: note that if you change the type of article you will need to re-write / update the existing content of the article body! Display: This will dictate how the article is displayed. Article icon (128x128 px): Gives you the option to assign an icon to the article that will be shown with the article when choosing an 'icon' layout for the article category. This also offers a selection box that allows for upload of new icons. These are the standard "Viewing options" that you can set. Display date: show creation date with article. Display title: show title with article. Display all articles in same category: show all article within same category within article. Display links to other categories: show links to other categories within article. Display author: show author with article. Display linktree: show the series of links that shows your position within the site/forum. Display comments underneath article: allows anyone to see comments on your article. Allow to comment? 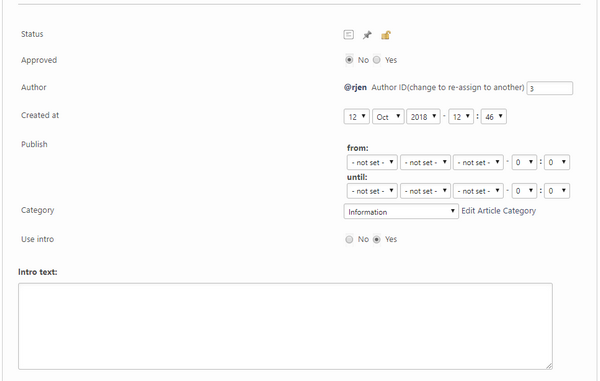 : allows users to leave short comments about your article. Display top: show information header with article. Not present in some themes. Do not collapse comments initially: comments are hidden/collapsed by default, this reverses criteria. Display number of views: shows how many times your article has been viewed by someone. Display ratings: shows the average rating and total number of rates. Allow to rate? : option to allow users to rate your article, based on article rate settings. The panels section allows you to configure how the display of panels will be when showing the article. You can choose to use the settings that have been made in the Article Category (default behavior) or configure what panels are shown for this specific article. Use settings from category instead! : Display the panels according to the settings in the Article Category. When setting this option the category settings will take effect: any setting made for the article (options below) will not be effective. Display right panel: option to show right panel blocks with article. Width right panel (leave empty for default): This setting allows you to specify a specific width for the right panel when displayed in this article. Display left panel: option to show left panel blocks with article. Width left panel (leave empty for default): This setting allows you to specify a specific width for the left panel when displayed in this article. Display top panel: option to show top panel blocks with article. Display upper panel: option to show upper panel blocks with article. Display lower panel: option to show lower panel blocks with article. Display bottom panel: option to bottom panel blocks with article. 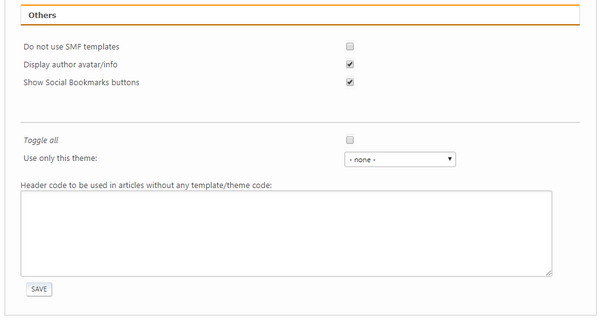 Do Not Use SMF Templates: meaning the article will not appear in a theme, or template. 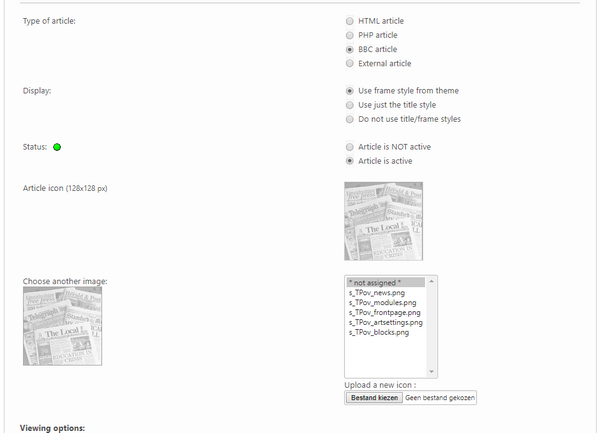 Use only this theme: select the overriding theme you wish the article to appear in. Header code to be used in articles without any template/theme code: allows for custom coding is no SMF template is used. Doc Written 11/23/2015 By: Ken.